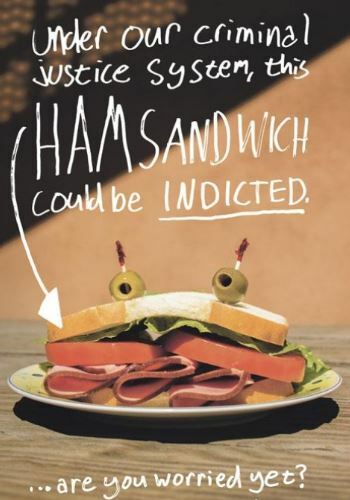 Could a Ham Sandwich Go To Prison? I have often heard prosecutors, judges, and attorneys say, "A good prosecutor can get a Grand Jury to indict a ham sandwich." This has made me wonder whether, if tried and convicted, the sandwich would actually go to jail. And if it did, and a guard or prisoner ate it, wouldn't that mean the sandwich had been given a death sentence rather than jail time? Also, why would a prosecutor want to indict a ham sandwich? Why not a hamburger? It's all very confusing. I suppose that, in order to fully understand it, one would have to go to a law school and take the course "Grand Jury Corruption 101." This seems to imply that Grand Juries will almost always indict anyone brought before them. Robert Mueller's "Russia Investigation" seems to prove this point. One of his Grand Juries (yes, he is such a "special" prosecutor that he has three Grand Juries at his beck and call) indicted a company called Concord Management, LLC. The only problem is that, in his arrogance, he never bothered to see if there was such a company. There wasn't, as you can see if you read the full story (link below). A little research proves that it is almost impossible to bring a case before a Grand Jury and not get an indictment. In 2010 alone 162,351 cases were brought before Federal Grand Juries. Only 11 indictments were refused. That is such a tiny fraction of 1% that it is hard to calculate it (.000067%). This makes the modern Grand Jury system the equivalent of the Salem Witch Trials. Back then, if someone was accused of being a witch, the townspeople would weight her down and throw her into a pond. If she rose to the top of the water and lived, that proved she was a witch, and they would burn her at the stake or hang her. If she drowned, she was judged innocent. Of course, I realize that Grand Juries don't put people to death. They just decide whether there is enough evidence to prosecute them. But many Grand Jury indictments have caused the death of innocent people's reputations, finances, and marriages. This took place in cases where lazy prosecutors obtained an indictment based on evidence so flimsy that they knew they couldn't win the case in court. So they tried the case in the court of public opinion, widely publicizing the indictment and parading the accused person around in chains, as they did this week with Roger Stone. This article is not about Stone, but he is a good case in point. Just a few days ago Mueller obtained a secret Grand Jury indictment of Stone for white-collar crimes. Normally with a person like Stone who is no threat to anyone, the prosecutor would call his attorney and tell him to come in and present himself for arrest. And Stone would certainly have done that, rather than face the spectacle and humiliation that occurred. Instead, more than a dozen federal agents in military gear arrived at Stone’s home before dawn in six black SUV's. With guns drawn they loudly banged on his door, frightening his wife and waking his neighbors. They refused to allow him to dress properly, dragged him out in cuffs, and presented him to the judge in jeans and a polo shirt. He was handcuffed and his legs were shackled. Shackling one's ankles make it impossible to walk; one can only shuffle. This is usually done only with violent criminals who might try to overpower the armed guards and try to flee the court. In this case, it was done deliberately to humiliate Stone. It would only have been done at the order of the corrupt Bob Mueller. Roger Stone has never been involved in violence of any kind. Yet the FBI sent stormtroopers armed to the teeth to bring in one old white-haired man. And they weren't just armed. They were brandishing their weapons. Sending that kind of manpower and firepower to execute a white collar arrest means the agents were either stupid or afraid. And they had absolutely no reason to fear Stone. There is no judge present to ensure that the proceedings are fair and legal. The defendant is not allowed to have his attorney present! Only evidence negative to the defendant is presented. Neither the defendant nor his attorney is allowed to present evidence or witnesses that may prove his or her innocence. The Constitution requires that a defendant is allowed to confront his accuser. This is not allowed in Grand Jury Proceedings. Jurors are not allowed to ask questions of witnesses. They must ask the prosecutor, who may decide to ask the witness - or may decide the question is irrelevant. The prosecutor can make a defendant appear guilty by forcing him or her to appear and plead the Fifth Amendment - even if the defendant had already formally informed the prosecutor that such would be the case. All proceedings are done in complete secrecy. This was once justified by saying it was for the protection of the jurors. But this is not done in the real trials where guilt is established, except in extreme cases such as terrorism. The need for secrecy is outweighed by the need for transparency so the public can whether the process is honest or corrupt. The use of the Grand Jury is defended by saying that it is "enshrined in history." But it is a mixed history, at best. Conceived in England in 1164, the original purpose was to protect the public from abusive prosecutors. Today it is used to protect abusive prosecutors from public scrutiny. Much of the United States’ laws derive from English Common Law. But even England abandoned the outdated Grand Jury system in 1933. Today the United States is one of only two countries in the entire world that use this abusive system. The other is Liberia. Most countries, including the U.S., rank at 20 or lower on the international corruption scale. Liberia is the very worst, ranking at 155 - worse than Russia. Do we really want to be in bed with Liberia regarding our legal systems? 48 U.S. states have provisions for Grand Juries in their Constitutions, but less than half use them. And many of the states who still use Grand Juries only use them in select cases, such as murder when capital punishment is an option. I wonder why so few states and jurisdictions use Grand Juries? In most cases, prosecutors have discretion about which cases they bring to the Grand Jury, and which they decide on their own to prosecute. So why use a Grand Jury at all? I believe it is for political reasons. If the prosecutor is up for election, you normally see the number of widely-publicized Grand Jury indictments rise rapidly. Could this account for the fact that a secret indictment and an arrest warrant was leaked to CBS so that they could have a camera crew on scene to humiliate Roger Stone as he was dragged from his home in front of his neighbors? Here is the problem with the claim that all federal cases require Grand Jury indictment. We know what a capital crime is. It is one in which the defendant could be put to death as the penalty. But what is an "infamous crime"? The Constitution does not define the term, but we can safely assume that it would not include crimes such as lying to the FBI. The FBI didn’t even exist when the Fifth Amendment was penned. So lying to the FBI, along with hundreds of other crimes where Federal Grand Juries are used, do not fall under the requirements of the Fifth. Read that again: “It is, indeed, common knowledge that the grand jury, having been conceived as a bulwark between the citizen and the Government, is now a tool of the Executive.” As we have seen, the idea of the Grand Jury was a noble one: To protect citizens from over-zealous prosecution by the English Crown, and later by the U.S. central government. But today, the tables have been turned and the prosecutors hide behind Grand Juries by going through a false exercise of indictment when they have already decided to prosecute. Otherwise, why is it almost impossible for a citizen dragged before a Grand Jury to not be indicted? According to the federal Guide to the Criminal Justice System for General Government Elected Officials, “The prosecutor is the most powerful official in the legal system.” I’m sure if you had been asked that question, you would have replied it was the judge – as I would have. The reason the prosecutor is more powerful than the judge is found on the same page as that quotation: Only 3% of those charged with crimes will ever be on trial before a judge or jury. A survey of State courts by the U.S. Department of Justice shows that prosecutorial discretion accounts for the fates of the other 97% of individuals. No individual should have that kind of power over the lives of citizens – even criminal citizens. The majority (52%) took plea deals. Police are allowed to lie to suspects about evidence they supposedly have, or about witnesses they claim will testify against the defendant. So the prosecutor can say to an individual, guilty or not, “I’ll give you three years if you plead guilty. Otherwise, I’ll crush you in court and you’ll serve 20 years.” It’s no wonder innocent people have taken deals like that. They felt they had no choice. 22% of the cases were rejected, usually because the prosecutor felt he didn’t have sufficient evidence. 18% were dismissed for various procedural reasons. 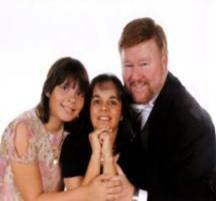 And 5% were “diverted” – sent to drug rehab or some other program in lieu of incarceration. The important thing about these cases is that it was all the decision of the prosecutor. He played judge and jury. So, if you think like I did, that the criminal justice system is fair because the judges and juries see to it – remember that only 3% of those accused will ever receive a trial. The 52% who took pleas will get to see a judge for the five minutes it takes to plead guilty. They hear bits and pieces of cases spread out over days or weeks. Parts of other cases are heard in between. They sometimes get evidence from one case mixed up with another. Prosecutors often give short lectures on the law that the jurors are supposed to use in deliberations. These are often complex concepts that took weeks for the lawyers to learn in law school. “Groupthink” often controls their deliberations. Since they are only given what the prosecutor wants them to know, they feel powerless to make good decisions. So if a few strong-minded jurors feel one way, the rest usually go along. This happens with real juries, as well, but at least they have heard both sides and they can send questions to the judge. They complain that the prosecutor controls everything to such a degree that the only judgment they can render is the one the prosecutor directs them to render. Your main takeaway should be that the Grand Jury process as used today is not enshrined in the Constitution. Yes, the right to a Grand Jury is guaranteed by the Fifth Amendment. But that right can be – and often is – waived, which means that a Grand Jury is not a requirement. I realize that some will see any criticism of the criminal justice system as being weak on crime or being anti-law enforcement. Anyone who follows my writing knows that is far from the truth. But the system is supposed to be about justice, and I believe that the Grand Jury system stopped being fair and just more than a century ago. I always try to offer solutions to the problems I discuss, but that is hard here. The only real solution I can see is to abolish the Grand Jury system nationwide. That seems like a good start to dealing with this nationwide problem.